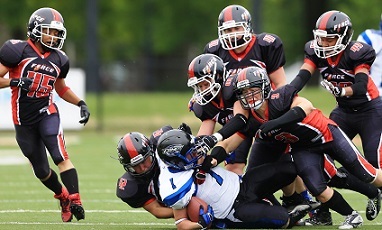 EVANSTON, IL: On a day set aside for honoring its predecessors, the 2014 Chicago Force (6-1) came alive in a rousing 72-8 win over the playoff-bound Columbus Comets. At halftime the Force organization gave tribute to numerous former players and coaches in their annual Alumni Day celebration. In addition, former running back Melissa Smith was inducted into the Chicago Force Hall of Fame for outstanding contributions in her five year career with the organization. Smith is the first offensive player inducted into the Force Hall of Fame and just the third player overall, joining linebacker Pam Schaffrath and safety Linda Bache, who were the inaugural inductees in 2012. Smith was a punishing, relentless runner and must have been proud of the tenacity she saw in current Force running backs Brandy Hatcher and Kelsey Casey as they combined for 325 yards and 6 touchdowns in the game. Hatcher was named the Offensive Game Day MVP for her 160 rushing yards and 3 touchdowns on just 14 carries. Casey added 165 yards and 3 touchdowns on 19 carries. 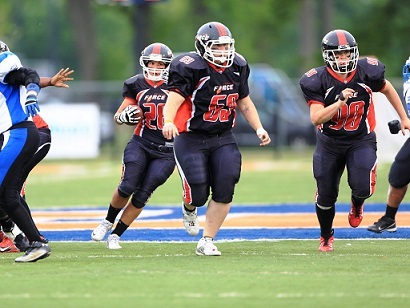 In addition, QB Kerri Olivar made her debut for the Force as she efficiently ran the spread offense, completing 8 of 9 passes for 104 yards, including a 20 yard touchdown pass to Jeanette Gray. Perhaps this year's Force squad was inspired by the presence of those talented players that came before them, as they played with fury and purpose on both sides of the ball. Defensive Coordinator Adam Lewandowski was encouraged by the play of his defense, "We executed well most of the game. I'm looking forward to making some corrections and continuing to improve as we head into the playoffs." Amber Kimbrough was named Defensive Game Day MVP for her 9 tackles and a sack. Other players leading the defensive effort were linebackers Jen Dulski, Emilie Belanger and Paula Lehtinen. Lehtinen also returned kicks and generated some excitement with 3 punt returns for 56 yards. With starting quarterback Sami Grisafe injured for the past 4 games, the offense has been reinventing itself each week through the genius of head coach and offensive coordinator John Konecki. To date, nine players have taken snaps at quarterback this season for the Force. Against Columbus the Force alternated between a power and spread offense, utilizing numerous players in various ways. Ashley Berggren played QB in the power set and scored the first touchdown of the game when she carried it in from the 12 yard line on a naked bootleg in the first quarter. The entire offensive line deserves considerable credit for this win, as they dominated the Comets from start to finish. "I was impressed with the play of the offensive line especially newcomers Anne Witt, Leanne Bluske, and Anna Sanford. And Kerry Olivar did an excellent job managing the game and providing the leadership we needed at the QB position," said Konecki. The Force finished the regular season at 6-1, won the division title and secured a bye for the first round of playoffs as well as hosting rights for the second round of playoffs. The Force will play the winner of the Detroit / West Michigan game on Saturday June 21st at Evanston Township High School. Game time will be at 5pm. For tickets and more information please visit chicagoforcefootball.com or call Sam Powell / Game Day Operations at 312-371-7813.